Humphrey Bogart is just so damned cool. Seriously, I wish I could talk like that for just a day. Rapid, intense, witty and with an air of superiority because damn the world it hasn't done anything for him. If you've ever seen a Bogart film then you know what you're getting from him in The Big Sleep (click here to add to your queue). He's the best at playing private detectives ever (sorry Jake Geddis). In fact, when I think of the words 'private detective' I think of Bogart running around and taking on the world. It's really film noir at it's best. He's teamed up in this one with his wife, the lovely Lauren Bacall and he solves another twisting and turning mystery. While it isn't on par with Casablanca or The Maltese Falcon this is still a very good movie and if you like film noir, or Bogie, you should give this a look. Why is it in your queue? 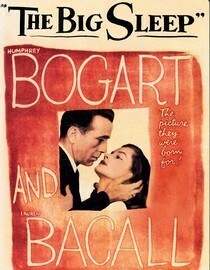 Bogart and Bacall, says it right there on the cover. Is it artsy? No, Bogart doesn't do "artsy". Best thing about the movie? Humphrey Bogart being Humphrey Bogart. What mood should I be in to watch this movie? Feeling cool. Looks like this movie is only available on DVD at this point, not for streaming. Am I missing something?